How many times have we been hearing the elders tell us "Don't drink cold or iced water because it will make you fat."? You know how the elders would have these "sayings" and if you, being an innocent and curious child, ask them "Why?" they don't know the rationale but despite the unknown explanation, we still listen because we know they know much better? Well, I just wanted to share with you guys the real fact about iced water. I'm sure that some of you already know this but for the sake of those who DO KNOW but need an explanation, here it goes. Iced water does not make you fat. A lot of people (not just elders--in fact, most of them are of my age) tell me not to drink cold stuff because I'll just gain weight. The truth is, it does THE OPPOSITE. Iced water is much better because your body will try to burn some calories to heat this water until it reaches your core temperature. I've read about this a lot of times and I've always wanted to blog about this but I thought that this was already known by a lot of people. Apparently, I've been told recently to forget about the iced water because I'll just gain weight. Thus, this blog entry was created to at least help those who believe in the famous myth. This iced-water-will-make-you-fat myth should be banished and so I decided to put this here as part of my weightloss entries. Anyway, I'm not saying you should go get a lot of frozen treats to burn more calories (lol). We all know what will happen after that. 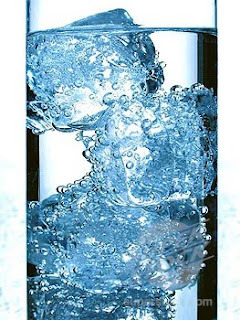 To at least get your metabolism high, go for an iced water instead of the plain refrigerated water. By the way, according to Women's Health, to increase the effectivity of this iced water fact, drink this after you wake up to jump-start your day's metabolism. Woohoo for iced water! Now let's free the iced water from being guilty for its charge of making people gain weight! 29 Travelers with Comments. Click to comment! Beautiful picture of iced water. I have heard before that cold water helps you burn calories. Hope so. Thanks for the reminder. sandra- No problem! :) TC! interesting, this is actually the first time that I heard about this myth. anyway, I always drink cold (not necessarily iced) water always, and I'm not that fat, so I guess it really is a myth. badong - hahaha nice one :D living proof ba? haha! buong akala ko pa rin talaga eh masama ang malamig na tubig pagkatapos kumain. kasi naninigas daw yung mga oil na kinain. thanks for this info. parang pwede ka na nga yatang sumali sa Discovery Channel's Myth Busters. hehehe. Hahahha Kuya Rj... Drink cold water lang after waking up or before meals but after meals, it's much better na medyo ung tama lang (as in ung hindi iced) kasi according to some sites, yes, nagsosolidify ung fats, making them harder to digest. pwede magpapak na lang ng yelo? axel - hahaha sige ba... nice one... tawagan nalang kita a hahahha! Veronica - Hahaha yeah... I'm glad you've heard about this one cos a lot of the other bloggers haven't heard about this yet... Lol... Regarding the fat + cold water thing, there are studies that are still undergoing since a lot had been contradicting the fact that the fat will solidify once inside the stomach. they said that even inside the stomach, that iced water will soon adjust its temperature to our core's and the fat will no longer be in solid form... haha. So good luck to them. Hahaha... Yeah, iced water and its wonders lol. I have never heard that in my life. I have heard, "Don't drink cold water because it will give you cramps." My wife tells me, "Don't drink cold water, it will give you terrible gas." (which I'd never heard before meeting her). It likely comes from confusing ice cold carbonated sugary drinks (which will make you fat) with water. Let's face it, carbonated (and sugary) drinks taste best cold. whoa! tlga?? then di pla yun totoo. so i can drink iced water w/o worrying. Yun din kasi sabi ng mama ko, cold water makes ur tummy big daw..